Special off season rates apply to our beach house in Otahu Road, Whangamata, New Zealand. It is a comfortable, modern 3 bedroom beach house with 2 bathrooms providing accommodation for your holiday stay all year round. It is 300 metres to the estuary, 500 metres down the road to the beautiful Ocean Beach - as shown in the photos and 1.8 kms to the surf club. The Estuary store has takeaways and coffee as well as bike, kayak, paddle boards and fishing gear to hire. This property especially suits a family of four or a couple sleeping upstairs and a couple sleeping downstairs providing privacy on each level. It has a north facing deck and upstairs enjoys the beautiful outlook of surrounding bush and a glimpse of the sea. The beach house is modern and light with an open plan living area, comfortably furnished including comfortable beds. All the modcons, including heat pump, dishwasher, fridge/freezer, Dvd, modern TV and Freeview, sky aerial (bring your own decoder) and Wi-Fi. The main bedroom upstairs has an en suite and 2nd bathroom downstairs has a shub (small bath) and shower and separate toilet. I respond to all inquiries instantly if at all possible. Baby gear available cot, high chair and small folding buggy free of charge. Please request at time of booking. January 7 night min preferred and Beach hop 4-night min. Leave the house clean and tidy and do the dishes before you leave. However (to mainly cater for overseas guests) linen can be provided by hiring it from the property manager/cleaner at an additional cost of $25 per person please advise at time of booking and I can arrange this for you. She will make up the beds and wash the linen afterwards. Whangamata is a favourite New Zealand holiday destination, voted New Zealand’s best beach in 2018, home to amazing ocean surf breaks, yet some of the safest swimming in the country. Famous for its Beach Hop and unique combination of beach and rainforest, the Pacific town also has great fishing and diving - providing weekend refuge and the classic kiwi beach holiday. Refer to thecoromandel.com for more information. My husband and I had this property built for us and we have had many happy family holidays in this lovely beach house. We have a property manager/cleaner who takes good care of our beach house for us. My husband is retired and I work as a part-time teacher. We have both travelled extensively throughout New Zealand and overseas. We welcome travellers from overseas and want to make sure they enjoy their stay in our holiday home. There are bedrooms. toilet and bathroom on each level providing privacy and space. You have the whole place to yourself. It's close to the beach and estuary. Downstairs bathroom with a shower over a shub (small bath) wiith separate toilet. Upstairs en suite off master bedroom. 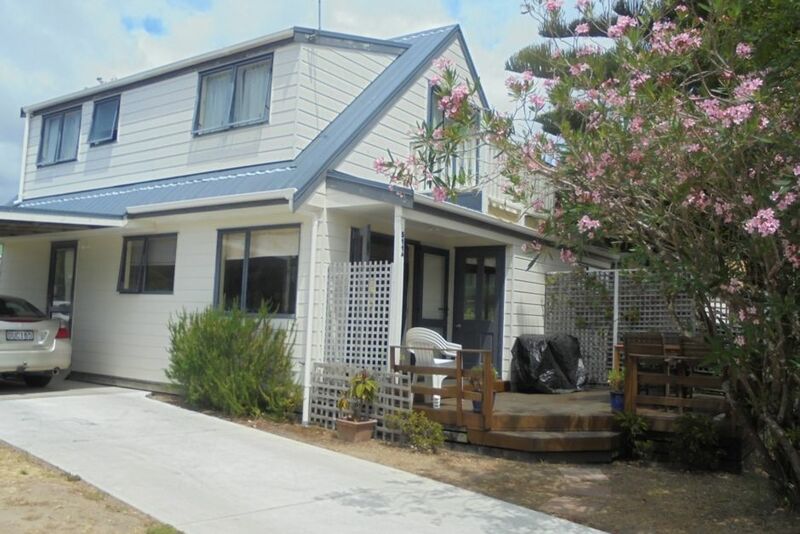 Within 1 kilometre of a great ocean beach and also an estuary. All linen (sheets, bath towel. beach towels, tea towels etc) provided at an extra cost of $25 per person. It is hired from the cleaner. Connections details are left in the house. Seating provided for 7 people plus a day bed. Full size stove and elements. Coffee, tea and pepper and salt etc provided. Plenty of cutlery, dishes and cooking utensils. Fully equipped kitchen with dishwasher and pantry. Full-size dining table and servery with stools. Bring your own sky decoder. A large selection of reading material available. For hire at the local shop. Two golf courses very close. There is also a single bed in the lounge. Really lovely place to stay. The place made our holiday so easy and relaxing - close to beach estury and dairy for daily ice creams! Highly recommend. Was great to have the entire house. Short walk to the beach. Loved Whangamata and the surrounding area. Very comfortable place to stay with everything that you need for a beach holiday. We thoroughly enjoyed our stay. I'm glad you enjoyed your stay. Our cleaner said she wished all the people who rented properties were as good as you. The house was comfortable to stay in and felt like a home away from home. The house was comfortable to stay in and felt like a home away from home. It was great to be able to walk just down the road to the beach. Great location for our needs with easy 5 min walk and on the sand. Thank you for that positive feedback it is much appreciated. I like to make sure that people are comfortable and enjoy their stay. Voted best beach in New Zealand by NZ Herald readers 2018. Whangamata Beach is one of New Zealand's most famous surf breaks, particularly the Whangamata Bar. The left hand break attracts surfers from around the world. At either end of Whangamata Beach are estuaries that are great for exploring by kayak or SUP (stand up paddle boards). Surf boards, SUP boards and kayaks can all be hired in town. Whangamata is also home to one of New Zealand’s most beautiful coastal attractions, Whenuakura (commonly referred to as Donut Island). For a long time Whenuakura was a local secret. This has changed in recent years as this pacific treasure is quickly becoming a ‘must do’ New Zealand adventure. The beach is also a great spot to relax due to its proximity to town. It is also great for walking and running along the 6km beach. Care must be taken in the dunes and fenced off areas to protect the endangered Dotterel bird species. SURFING WHANGAMATA: The beach break is good for surfers of all levels. The bar is reserved for experts, remember to respect the locals in return for your share of the good times.